Kandal Market, or Phsar Kandal in Khmer, is the “market in the middle,” or “central market” (not to be confused with the other, major Central Market in Phnom Penh). Though Kandal Market does sell goods such as clothes, shoes, bags and jewelry, it’s primarily known as the food market for locals. There’s no better way to get a real sense of place than by visiting a local market; take a trip to Kandal and immerse yourself in the colors, textures, smells and tastes of Cambodia. From fresh veggies stacked high to jewel-like displays of local fruits (many of which are unrecognizable to westerners) to the large selection of fresh seafood, fish and meat—some of which is still moving—the market can be almost overwhelming to the senses. Fight the slightly claustrophobic feeling and slowly wander the stalls. The men and women who wait patiently for customers will often let you sample fruits and veggies; taste something that looks unfamiliar. You may be rewarded by the sweet flesh of the lychee, but it’s advisable to avoid the big, green spiny fruits—both jackfruit and durian have a smell that’s hard for visitors to stomach. Kandal Market (Phsar Kandal) is located on Street 13 (Preah Ang Eng) in Phsar Kandal 1 Commune and is open from early morning until late evening. To get a real sense of the place, get there early to see the hustle and bustle of the daily grocery run. Get the inside scoop on Phnom Penh’s foodie hotspots on this tantalizing half-day tasting tour. Browse the stalls at Pshar Kandal and Pshar Chas markets; visit cafés and restaurants in Phnom Penh’s old French quarter; and seek out the city’s best street food stalls. 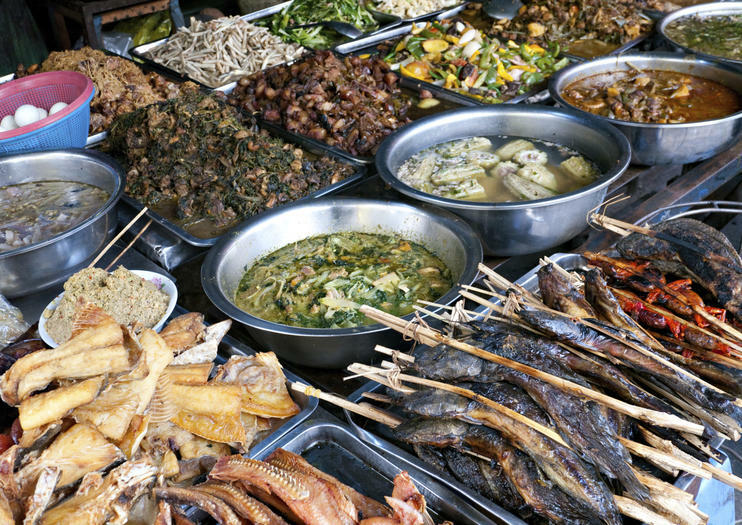 Along the way, sample an array of specialties including fried noodles, papaya salad and sweet coconut dessert. Private workshops with professional photographer Gemma Sandell based in Phnom Penh, with the option of one or two days. The workshops are focused on street photography and portraiture. They offer the perfect way to find the lesser known spots around the city that make for great street shooting. Gemma’s photography tours offer an intimate insight into the city and it’s people.You will spend the first day exploring some of Phnom Penh’s hidden gems - secret back alleys, lesser seen neighborhoods and authentic wet markets. You will stop for local food along the way. The day will finish on the bustling riverside, where you’ll practice some portraiture under Gemma’s supervision.Day two will start with breakfast at a market and another great chance for photographing interesting characters. You will then take a ferry to Koh Dach where you will see some local cottage industries, explore countryside villages and beautiful farmland. Private workshops with professional photographer Gemma Sandell based in Phnom Penh, with the option of one or two days. The workshops are focused on street photography and portraiture. They offer the perfect way to find the lesser known spots around the city that make for great street shooting. Gemma’s photography tours offer an intimate insight into the city and it’s people.The one day workshop starts in the bustling city, where you will visit hidden backstreets and some unusual neighborhoods to get a taste of life in Phnom Penh. You will then visit a wet market - perfect for portrait shots - where you will also break for lunch. In the afternoon you will take a ferry to Koh Dach, where Gemma will show you her favourite villages and you will experience some cottage industries. Gemma’s bond with the people of Phnom Penh and grasp of the local language make for a very authentic experience.